Noir Naturals Soap Fundraising Program for Schools, Churches, Student Groups and Non-Profit Organizations, in New Orleans, Louisiana, Baton Rouge, Louisiana and Houston, Texas. Looking for fundraising ideas? Want a unique way to raise funds? If you are a student, school, church youth group, club, sports team, missions group, camp, dance studios, sports club, student organization, sorority, fraternity, honor society, womens or mens ministry group consider fundraising with us. Earn 50% profit. Charles Kennedy, owner of Noir Naturals a division of His Grace Enterprises LLC believes giving back to the community should be a rule, and not the exception. Noir Naturals as a company shares the same belief, and gives back through the soap fundraising program. 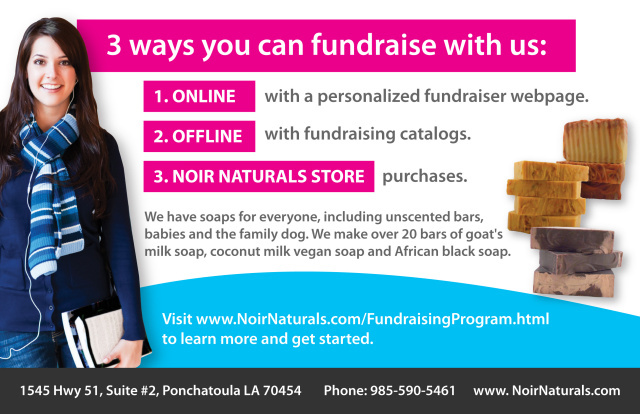 WHY FUNDRAISE WITH NOIR NATURALS? Noir Naturals offers something different. Everyone uses soap, and our earth friendly, goat's milk and coconut milk vegan soaps will stand out among the sea of chocolates, cookies, wrapping paper, and other fundraising products that saturate the market. We are happy to say that we are the manufacturers of our soap. We do not work with middle men or third parties to delay delivery of fundraising orders. We make soaps daily in our store. Fundraising individuals and organizations can earn $2.50 for each bar of our natural soap sold through our program. Since most bars cost only $5.00, fundraiser supporters can easily purchase multiple bars without breaking the bank, and you earn an average of 50% profit. WHO IS THE NOIR NATURALS FUNDRAISING PROGRAM FOR? Pre-K to Pre-College Students - Individual students, daycares, schools, church youth groups, clubs, sports teams, missions groups, camps, vacation bible school groups, dance studios, and any children’s group organization or cause. College Students - Individual college students, sports clubs, student organizations, sororities, fraternities, honor societies, associations, and any college student group, organization or cause. Adult Groups - Missions teams, women's ministry groups, men's ministry groups, and young adult bible study groups. HOW DO I RAISE FUNDS USING YOUR PROGRAM? Online - We’ll create a personalized webpage for you, where supporters can participate in your fundraiser. Haley, a 16 year old student raised funds selling our soap to friends and family members to go on a church missions trip to Haiti. Click here to visit Haley’s Trip to Haiti customized webpage. Noir Naturals Store – Raise funds by having supporters purchase soap at our retail store. Fundraising sales will be tallied and given back to the individual/organization at the end of the fundraiser. IS THERE A MINIMUM NUMBER OF BARS THAT NEED TO BE SOLD FOR A FUNDRAISER? Each fundraiser requires a minimum of 50 bars of soap to be sold. From experience our customers purchase an average of 4 bars of soap at a time. This means that if only 13 persons purchase 4 bars each, you’ve made your minimum that easily. Customers have said to us time and time again that they love our soaps, and end up becoming repeat customers. We have no doubt that you will have a similar encounter. There is no cost to get started unless you would like to pre-purchase bars of soap to sell at an event. WHAT SOAPS WILL THE FUNDRAISER CONTAIN? We have over 20 goat’s milk soaps and 4 coconut milk vegan soaps. We have soaps for everyone, including unscented bars, babies and the family dog. CAN WE FUNDRAISE WITH ANY OTHER NOIR NATURALS PRODUCTS BESIDES SOAPS? Our soaps (both goat's milk and coconut milk) are our number one product sellers, with our goat's milk lotions following closely behind. We have a total of 10 goat's milk lotions which we can add to a soap fundraiser to help boost fundraiser sales. Our 8 oz bottles of goat's milk lotion (with pump) cost $10. Fundraising individuals and groups can earn 50% profit from the sale of lotions. If adding goat's milk lotions to a soap fundraiser is of interest, please discuss with the Noir Naturals Fundraising Program Manager. DO YOU PROVIDE REWARDS FOR TOP FUNDRAISER SELLERS? Yes. Noir Naturals rewards up to the top 3 sellers in each fundraiser with gift cards from Wal-Mart, Target, Best Buy, Amazon and Visa. Gift card denominations range from $75 to $25. A pizza party is also an alternate option for rewarding fundraising student groups as well. The Noir Naturals Fundraising Program Manager will work with the Organization Fundraising Coordinator to determine the best mix of rewards for the fundraising group. WILL YOU PROVIDE A REWARD IF I REFER A GROUP OR ORGANIZATION TO FUNDRAISE? Yes. Noir Naturals will award a $50 gift certificate to anyone who refers an individual, organization or group who works with us to raise funds. I'M NEW TO FUNDRAISING. IS THERE ANY GUIDANCE YOU PROVIDE? Yes. Our goal is to ensure you are well set up for a successful fundraising event. We have a dedicated resource who will work one on one with you before, during and after the fundraiser to help you meet your goals. We will even compose a press release for the local media, if needed. We also understand that every fundraiser is different. Fundraising group sizes differ, as well as participation rates and fundraising needs as well. We will work with you to come up with the best strategy and plan for your fundraiser since each is unique. HOW DIFFICULT WILL IT BE TO CONTACT YOU AFTER STARTING A FUNDRAISER? We are easy to reach in person at our store, by phone, email and social media. We are on Facebook, Twitter, Google +, Pinterest and Instagram daily. WHAT OTHER SERVICES DO YOU PROVIDE FUNDRAISING INDIVIDUALS OR GROUPS? Noir Naturals provides product samples to help boost fundraiser sales. From our experience the ability to touch, feel and smell the products makes a significant difference in sales. We will sort and package fundraiser orders by seller for easy distribution at no cost. We also provide free shipping of fundraiser orders going to a single location. For locations local to our store we will deliver orders to a single location at no cost. I’M READY TO GET STARTED WITH MY FUNDRAISER. WHAT IS THE NEXT STEP? Complete the short form below and our Fundraising Program Manager will be in touch with you shortly.